Ella's Lead - WHO WANTS A GIFT CERTIFICATE?? Ella's merchandise is the best and I would love to win! Sign me up! Love your products!!!! I SO badly want a Christmas collar! Please sign us up! Oh how I'd love some new dazzle for the dogs. you know I want a chance to win! Lindsay Moore, sign me up please! Id have to decide what Ella's Lead collar I want for Raji next.....oh darn. Genia Wilson. Abby would look awesome in one of your collars! Amanda Beiting, sign me up please! Would love to win a gift certificate! We love your collars! My great dane would love a new collar. We need a nice collar! Pick me - we love ella's leads and want to show everyone how beautiful they are! Pups need a new collar and yours are awesome. I hope 2 win a new show collar 4 Scorch 2 wear @ the ADBA nationals! Lori Burkett. Hope we win! My new rescue needs her own snazzy collar! Kiersten Morey wants the g.c! We love Ella's Lead beauty and quality. Thank you for the opportunity to win a $25 gift certificate! 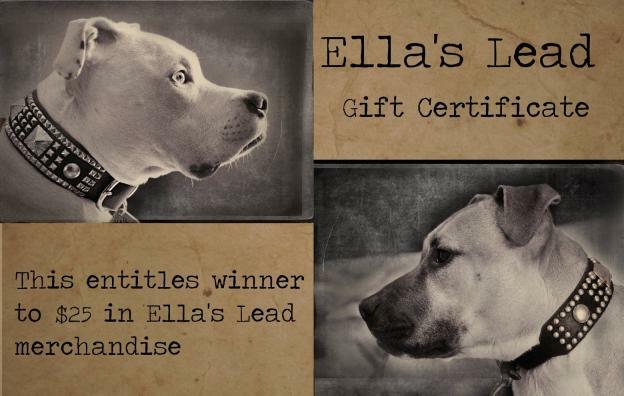 I would love an Ella's Lead GC, I so badly want to get my boys their Walking Dead collars. Hey Becca! Hope I win! Hope I win. Need another collar for new dog. Victoria Parker would LOVE a $25 gift certificate!!! How exciting! I am ordering a collar today! Sign me up please- I've got my eye on a new collar for Tate! This would be so awesome as an early Christmas present for my girls! I would love to win an Ella's Lead collar for my Julia. Every time I see a new picture I wish I could afford one! but the only way my girl will have one is to win a contest! Ellie wants a collar to match Mona's...so we definitely want to win! So many to choose from, they're all Beautiful!! Yeah!!! We love you guys! These are the nicest collars I have seen, would love one! Sign me and my babies up! Leah Scarborough Thanks for the opportunity!!!! I love all your collars they are beautiful. The hardest thing is trying to find one or two to order I make up my mind and every day you add more I love them all. Sign me up! The hardest part would be choosing which collar I wanted! Please pick me. I need two new collars! Sarge needs one of your collars. He's been telling me for months that he needs a fancy one with with lots of bling. New puppy means new collar. Always hoping to add to the collection! More Ellas Lead collars would be awesome, just cannot get enough! I could use a new leash! My Day-Z needs some bling! Love you collars, would love to a gift certificate to help me buy one! You guys make such beautiful collars! I'm getting ready to order a second martingale for my female Bull Terrier. Love love LOVE you guys!! Sign me up please. Your collars are amazing. Mr. Buddy or Mitzy Mu would love one! Sign me up! I've got about 6 collars that I've been dying to get! Beautiful collars for beautiful dogs!! I would love to win the gift certificate for $25.00. Pudge needs a cool leather collar soon! Signing up for a chance to win! My name is Hope Gonzales! Tania would love to be the next winner!. Pick Lori Lockman! We love your collars! Would love to use this to get the Walker Bait collar for our puppy!